Ready to get out of your comfort cooking zone? Perfect! Octopus! It won’t bite you, won’t come to life and throw ink to your face, won’t take forever to cook and won’t be hideously chewy or have a bland or funny taste. 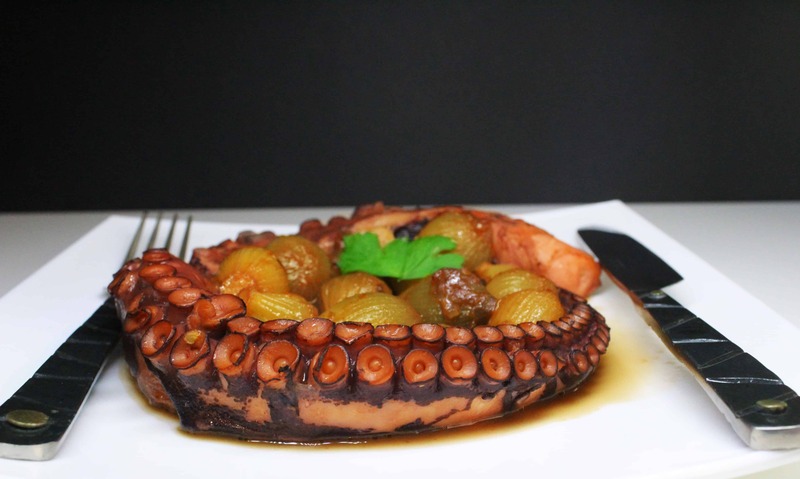 On the contrary, octopus with onions stew will be an excellent addition to your cooking list because I am sure that if you follow my recipe and tips, you are going to love it. Prepared and cooked with respect to that beautiful and intelligent sea creature, the octopus can be delectable. I recommend it even for those who don’t like fish or seafood. Give it a try and have a bite. It may delightfully surprise you. Fish and seafood are eaten on a regular base in the Mediterranean diet at least twice per week. The main benefits of this food group come from its omega-3 fatty acid content. Octopus is low in calories and very high in protein as well as an excellent source of protein, calcium, iron, potassium, phosphorus, selenium and several vitamins. The only challenge for that recipe is to find the main ingredient, the star of the dish, the octopus! I know it is rather difficult to find fresh octopus at reasonable prices, so maybe the option for a frozen octopus is better. Fish markets carry both fresh and frozen octopus and in case you don’t find, ask your fishmonger to get it for you in a couple of days. If you are lucky to have a well-stocked grocery store near you, don’t hesitate and buy one. Furthermore, you may purchase good quality, usually frozen, baby octopus in Asian markets. Ask the fishmonger to clean your fresh octopus or purchase a cleaned frozen one. Leave the frozen octopus to thaw overnight in the fridge and proceed with its preparation. If not cleaned, you should do it yourself. In case the sac isn’t clean, take your kitchen gloves, place the octopus in the sink and turn the ink sac inside out. Remove and discard the sac, stomach, and eyes from the large head cavity. It’s messy but easy to do. Rinse well and proceed with the beak. I have never cleaned an octopus before because it is already cleaned by my fishmonger. (Have I told you that I have THE best fishmonger in the universe? Yeap!! But this is another story for another post). So, I will not pretend to be a clean-an-octopus-expert and that’s why I found this video for you to give you a hand. It’s not necessary to rub the skin off because its gelatinous, almost fatty, substance gives a nice texture to the sauce. 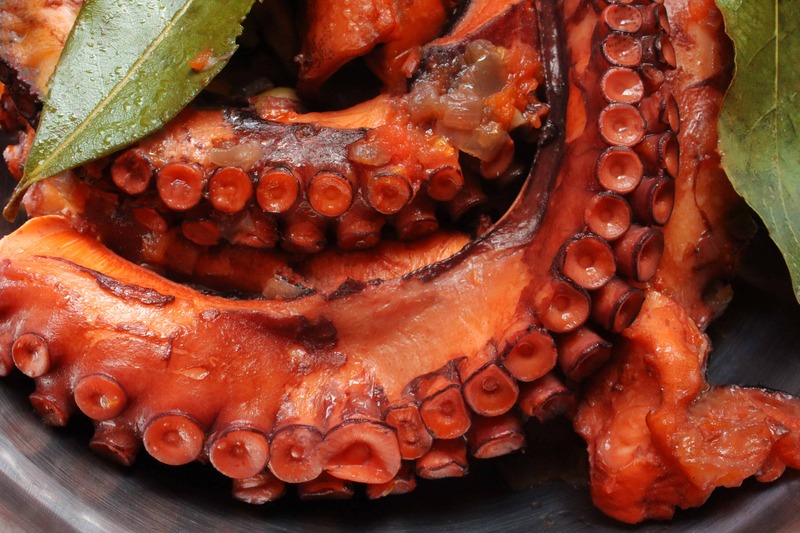 There are several ways to tenderize an octopus and almost every Mediterranean country has its own version. The traditional Greek way is kind of cruel because it’s about beating freshly caught octopus against the sea rocks and then rub it in a circular motion against the same rocks until it foams up and changes color. I know, poor octopus. I vividly remember that procedure from summer vacations during my childhood. Imagine a bunch of tanned children wearing their bath suits, sitting on the rocks, and waiting patiently for the adult-amateur fishermen (fathers, uncles, or friends) to return with their catch of the day. Octopus was our favorite catch because we used to help with tenderizing and take it to the nearest tavern or house to grill it. Such a bliss! I still remember the divine taste and this is exactly this memory I recall every time I cook octopus. For God’s sake, don’t start whacking your octopus against your sink, kitchen floor or garden pavement stones. You may sometimes skip the tenderizing procedure, if your octopus is small, let’s say less than 1 ½lb (680g) and proceed with the cooking procedure. If it is 2lbs (1kg) and more, it is better to consider whacking them around with a kitchen hammer or meat cleaver or any heavy kitchen cookware near you. Guys, don’t overdo it! We need to gently tenderize it and not mash it. If the octopus is cooked right, its texture is slightly (but pleasantly) chewy and of course delightfully tender. The following tips will make you get the perfect texture and tenderness. The most important is to simmer, not boil the octopus. Additionally, you don’t have to stir the stew. So, give it time and leave it alone in the pan. At the beginning, we are going to simmer the octopus for 20 minutes. This is a “kill two birds with one stone” cooking technic because you end up with more or less three cups of octopus broth (needed later on) and an even more tenderizing octopus. Clever cooking, isn’t it? I usually cut a large octopus (2.2lbs – 1kg) in pieces. I keep the tentacles intact by cutting them at the joints and the sac in large pieces. I save extra cooking time. Choose shallot onions for that recipe. To peel them easily either leave them in a bowl covered with water in the fridge overnight or leave them in hot water for half an hour. Don’t chop them. Only peel them and let them braised together with octopus. When cooked, octopus loses a lot of its volume, so don’t assume you did something wrong. No salt for that recipe. Octopus broth will be salty enough for a perfectly balanced dish. 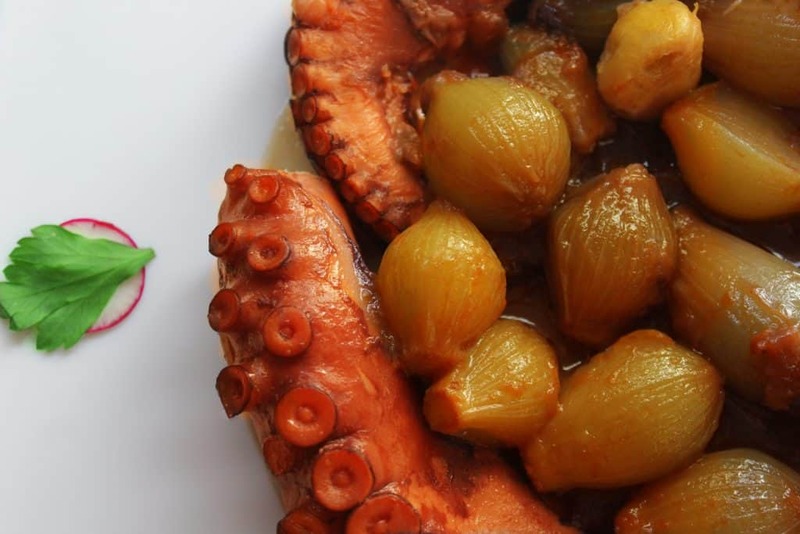 This traditional octopus stew is called stifado because of the shallot onions. You may find other stifado recipes with rabbit and beef. Serve it with pasta, rice, potatoes, fava or plain with a slice of toasted whole wheat bread, a glass of white wine and cabbage salad. If frozen, let the octopus thaw overnight in the fridge. Rinse the octopus well under running water to clean well the tentacles and the sac (inside and out). The sac should be empty, eyes and beak removed (see instructions and video above). Use a kitchen hammer (or other heavy kitchen cookware) to tenderize the octopus (only if the octopus is big like the one in the recipe which is 2.2lds (1kg)). 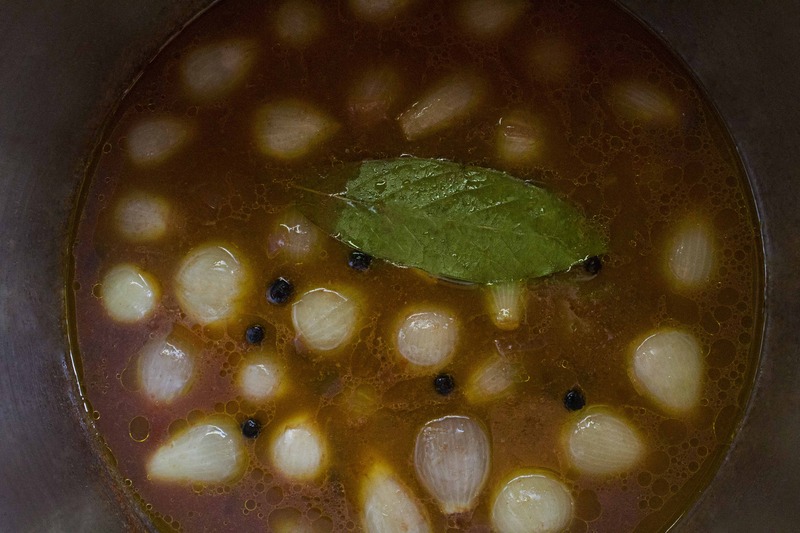 In a large pan, bring 2 cups of water to a boil, add the octopus and simmer for 20 minutes. 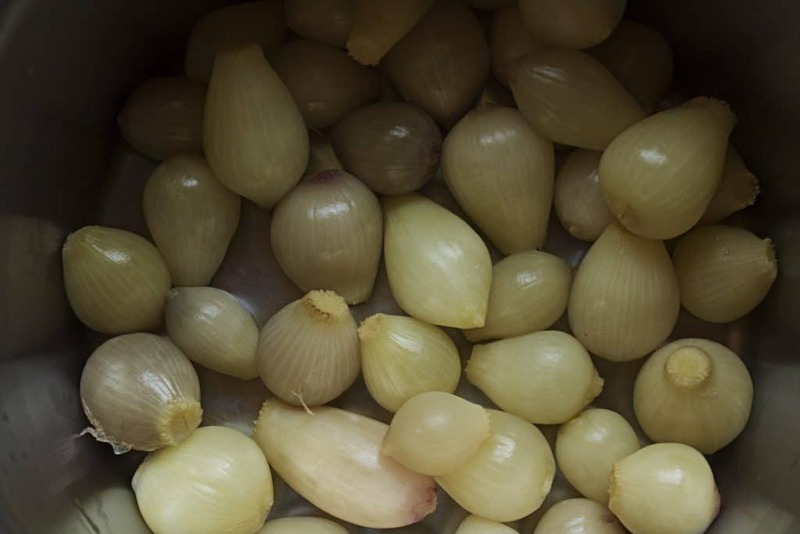 In the meantime, boil water in another pan, remove from heat and put the shallot onions in to soften for half an hour. Peel them carefully. Remove the octopus from the pan. If the octopus weights more than 2lbs (1kg), cut the tentacles at the joints and the sac into 4 pieces and let aside in a bowl. You may not cut the octopus into pieces but that will increase cooking time. Strain the broth and keep 3 cups. Use the same large pan (cleaned) and add the olive oil. Sauté the onion and garlic for 2 minutes, add the octopus and sauté for another 2 minutes and finally the shallot onions for another 2 minutes. Pour the broth, allspice berries, bay leaves and pepper. No salt. Simmer on medium-low heat for 20 minutes. Check the tentacles and if they are tender enough to be easily pierced with the point of a knife, remove the octopus from the pan. Don’t overcook it. Add the vinegar, the tomato (or passata) and the tomato paste (optional). Simmer for another 10-15 minutes until the shallots onions are tender to taste and the sauce is thick. Remove from heat and add the octopus. Cooking time may be considerably less for smaller octopus and twice as long for larger, tougher ones.